An Oregon Scientific classic. Just activate it once and enjoy all the features of a traditional alarm clock or desk clock plus the unprecedented accuracy and convenience of ExactSet atomic clock technology. 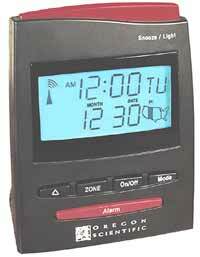 A vivid blue HiGlo backlit LCD screen displays the time in hours, minutes, seconds, month and day. Actual size: 3.25" x 2.25" x 4.5"